What can the church learn from a Starbucks barista? Evans serves up joy one cup of coffee at a time. Feeling crappy about the state of the world and our nation in particular? Well, let me introduce you to Evans. Evans will make you feel better. His job—or calling, I might say—is to make you feel better. I met Evans this morning standing in line at an airport Starbucks. It was a long line. It was early. I needed caffeine. But they had the tunes cranking, James Brown was playing, and Evans—the barista—was dancing and singing out loud as he worked. “I’m sorry people, I’m sorry,” he shouted to the growing coffee-thirsty crowd. “But I just love this song! I love it! So I’ve just got to sing and dance.” After the song was over, though, he didn’t stop. He kept dancing, coordinating his barista moves of pouring our dark brews, mixing our caramel macchiatos and whipping our cappuccinos into his choreography. When the cashier took our order she wrote our name on our cup before handing it to Evans. This was his point of entry. “Hey, Teri! How are you doing, Teri? Are you having a good day?” How could the answer be “No” in the face of such exuberance? Evans spoke like this to each customer. He greeted the man in front of me, Alec, so warmly that, having not yet caught on, I thought they were old friends. “Hey, Alec.” Evans said. “Great to see you, man. I’m going to take care of you today. Don’t you worry. I got you covered.” Alec didn’t seem to be having a good morning, but he managed a smile when Evans handed him his iced coffee with cream. Evans’ effect on the people gathered for their ritual morning coffee dazzled me. In the friendliest of ways, he broke down our stoic, I’m-in-public inhibitions, giving us permission to show a little joy ourselves, turn to our neighbor to share an appreciative laugh, or help her with the pot of creamer that was extra dribbly today. He single-handedly transformed that Starbucks into a space where community was fostered, where joy and kindness were collectively shared. 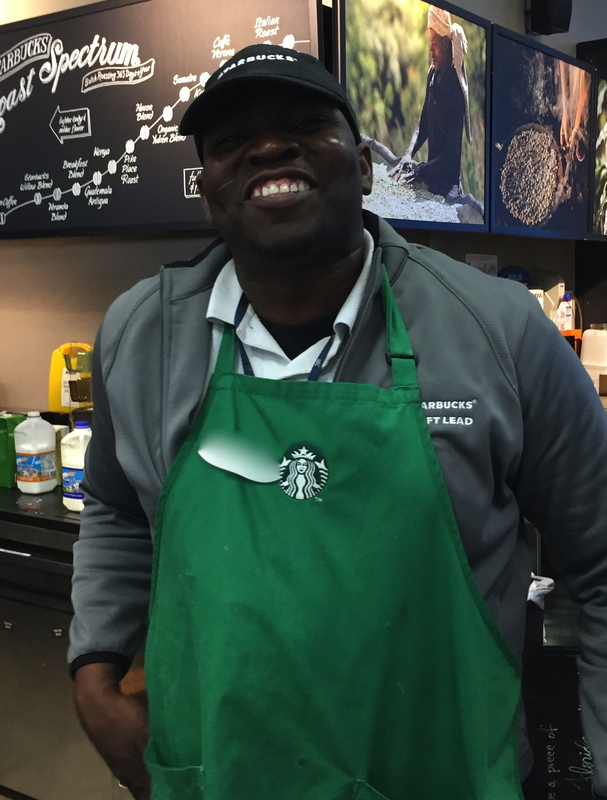 When Evans handed me my coffee, I asked him if I could take his picture because, as I told him, “You’re awesome, and I want to remember you.” The five or six customers gathered around smiled and laughed appreciatively at my desire to acknowledge our favorite barista. They cheered for Evans as he posed, proudly, for my picture. Evans’ effect on me didn’t stop, though, once I left the coffee shop. Afterwards, I found myself smiling more at the strangers around me. I offered a napkin to a man who spilled his coffee. I wasn’t irritated with the woman who took the clean sink I wanted in the restroom. Generally, I found myself to be a more outgoing, positive, caring person after my time at Starbucks. The whole experience felt like church—if church could be defined as a place where community is created and people are transformed into new and better versions of themselves. Because I serve as the chaplain of a college, I was recently asked to lead a workshop on how to attract young people to the church. If it works out that I can do the workshop, I think I might begin by introducing those gathered to Evans and his style of service. Not everyone can be Evans—he certainly is someone special. But we, in the church, can learn from him if we pause to ask some relevant questions. How did Evans create community in that Starbucks? What was he offering, besides coffee, that was attractive? How did he inspire positive change in the people he served? And how might we provide a similar experience? Hat’s off to Evans. I bet everything wasn’t all that great, but he knew how to lift himself and his listeners. I used to pass a man on the corner holding a pizza for sale sign. He was always moving, a delight to watch. I rolled my window down and told him I’d love to have a job to offer him at better pay but I don’t. I missed him later. Hopefully someone else had that job he needed at pay that befitted him. Thanks for your comment, Oneta! Thanks for sharing your encounter with Evan. It was a beautiful reminder that kindness makes a difference.